Tony Blair's cabinet reshuffle will ultimately lead to the abolition of the ancient post of Lord Chancellor. BBC News Online looks at the role, its history and what will replace it. The first was Angmendus in the year 605. Powers expanded in 1972 to include appointment of judges, running court system, tribunals and legal aid. In 2002 it took over responsibility for Electoral Law, Data Sharing and Party Funding. Department headed by Lord Falconer, the new Secretary of State for Constitutional Affairs. A supreme court will replace the law lords, the final court of appeal for important cases. WHAT HAPPENS TO POST OF LORD CHANCELLOR? Post is to be abolished. But as the role has some powers which only the lord chancellor can exercise, there must be legislation to transfer such powers to the new Secretary of State for Constitutional Affairs. Lord Falconer will take on the role of lord chancellor until then. 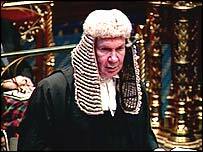 But unlike his predecessor, Lord Irvine, he will not sit as a judge in the House of Lords. Judges will no longer sit as politicians. WHAT HAPPENS TO SPEAKER OF THE LORDS? He or she will be a non-minister. Peers will be asked how they want the speaker appointed.